The 7972nd Labor Supervision Center, a US Army organization, with apprx. 20 Officers and NCO’s, was one of several LSC’s with the mission of controlling and assisting Labor Service units. Sgt Hutchins served with the 7972th from Nov 1951 – Feb 1953 as supervisor with the 8541th in Ettlingen, Rhineland- Kaserne. 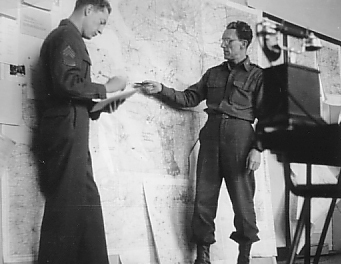 Photo (left) shows LtCol Lynn in the field HQ during the Flood Relief Operation in the Netherlands in Feb 1953. Sept -- Activation in Eschborn near Frankfurt; CO was LtCol Lynn. Recruitment of LS Personnel by 1stLt Coleman and one Sgt. Apr -- Relocation to Bensheim-Auerbach; stationed in Hotel “Krone” together with 8540th LS Engr DUKW Co.
Detachment Rüsselsheim (8542nd) CO: ? Aug -- Deactivation along with the formation of the two Labor Service Battalions 6960th CLG & 6961st CLG which were placed under the command of 11th Engr Gp and 555th Engr Gp, respectively. 8540th, 8541st and 8542nd LS Engineer Amphibious Truck Company. These units are equipped with the Truck 2 1/2 ton, 6x6, Amphibian , commonly known as the DUKW. The 8540th moves to Bensheim-Auerbach; the 8541st to Ettlingen; and the 8542nd to Rüsselsheim. 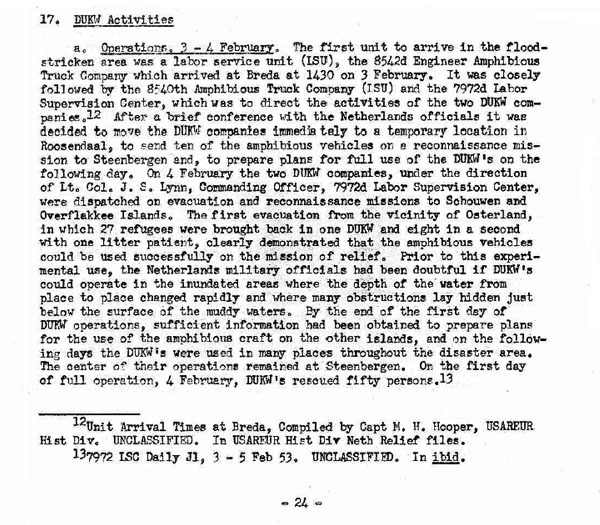 Two of the units (8540th and 8542nd) participate in the flood relief operations in the Netherlands. The 8595th LS Engineer Bridge Maintenance Pltn is formed at Neureut and attached to the 6960th LS Engr Bn. 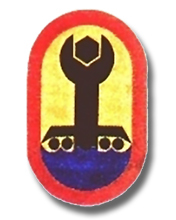 The 6960th was attached to the 11th Engineer Combat Group in Schwetzingen. The 6961st was attached to the 555th Engr Cbt Gp in Karlsruhe. The 8595th LS Pltn was disbanded. The 6960th designs and constructs - using old heavy equipment from the Wehrmacht engineers - twelve MLC 100 ferries. Construction site was the Rheinauhafen in Mannheim and the ferries were put into operation at the six swing bridge sites. All of the DUWKs used by the engineer units are returned to Army depots. Discussions are initiated with the German Territorial Command to transfer the swing bridges and associated equipment to the Bundeswehr. The 6960th and 6961st (minus the 8591st, 8592nd and 8594th companies) are transferred with personnel and equipment to the Bundeswehr. 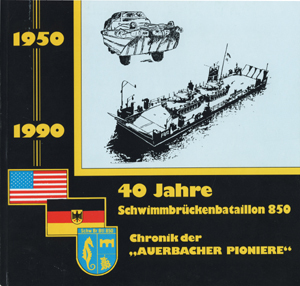 A unit history of the Labor Service DUKW units that were formed in September 1950 as Labor Service Amphibious Truck Companies. Several of these would later be grouped together under the 6960th Civilian Labor Group. This book covers the histories of the 6960th and its subordinate units from the beginning in 1950/51 until 1965 when the battalion's mission was assumed by the German Army. It then continues with the history of the newly formed 715th Heavy Engr Bn (German Army) which assumed the mission from the 6960th and its successor units, the 880th Heavy Float Bridge Engineer Bn (1976) and the 850th Float Bridge Engr Bn (1981). Effective Jan 1 1965, the 6960th LS Battalion (Swing Bridge M&S) was transferred to the German Bundeswehr and reorganized and redesignated as the 715th Heavy Engineer Battalion (Schwere Pionierbataillon 715). The battalion remained stationed in Bensheim, Germany. At some point prior to 1981, the battalion was redesignated as the Schwere Schwimmbrückenbataillon 880 (880th Heavy Swing Bridge Battalion). The unit remained in Bensheim. In 1981, the battalion was moved to Pfungstadt, Germany. The battalion was reorganized and redesignated as the Schwimmbrückenbataillon 850 (850th Swing Bridge Battalion). 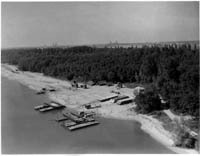 Mission of the battalion was to support river-crossing operations on the Rhine River through the operation and security of swing bridges at fixed locations (Kornsand near Oppenheim, Leimersheim, Rheinhausen, Eich, Brühl and Germersheim) and military ferries. I was member of the 8594th Labor Service Float Bridge Co stationed in NEUREUT near KARLSRUHE in GERMANY. Later I was in the 8595th LS Bridge Maintenance Platoon. I was the Supply Sergeant in both units. Both units consisted of 100% German civilians. The Neureut Kaserne was divided into two separate camps. One was occupied by the US Army and consisted of the standard German, two-story barracks buildings. 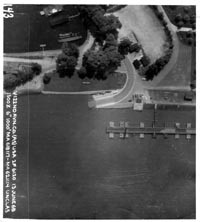 The other camp, primarily one-floor buildings (see photo #4), was used by the Labor Service: 6980th LS Signal Construction Bn, 6981st LS Signal Construction Bn, 8594th LS Float Bridge Co and 8595th LS Bridge Maintenance Platoon. 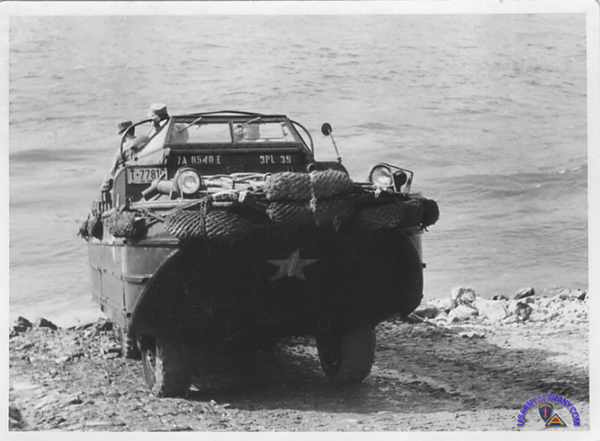 Originally, several units of the 6960th were equipped with DUKWs (official: Truck 2 1/2 ton, 6x6, Amphibian) which were used for moving equipment and personnel across the RHINE RIVER. One of the DUKWs was restored by mechanics of the German Army (former personnel from CLG) in 1990 and can be viewed at the famous technical museum in SINSHEIM. 144 DUKWs were turned in during 1964. 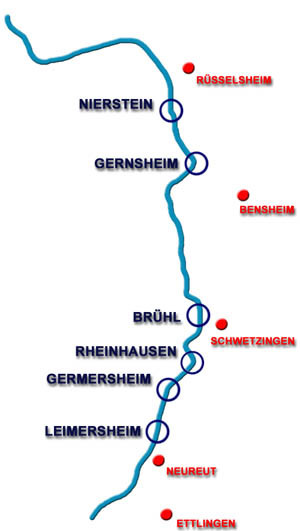 In 1958, the 6960th with the 8540th, 8541st, and 8542nd CLGs took over 6 swing bridges from US units along RHINE river at LEIMERSHEIM, GERMERSHEIM, RHEINHAUSEN, BRÜHL, GERNSHEIM and NIERSTEIN. The 6960th was renamed 6960th Directorate, Swing Bridge Maintenance & Security; the 8540th, 8541st and 8542nd CLG Amphibious Truck companies were redesignated CLG (Swing Brg Maint & Security). In 1959, the CLGs were reorganized: the 6960th CLG Bn was placed under the 11th Engr Gp and the newly activated 6961st CLG Bn under the 555th Engr Gp. Photo: The two sections of the swing bridge at Gernsheim being pivoted towards the middle of the Rhine River where they will be pinned together to allow vehicles to cross. In the "open" position, the bridge sections were tied down and left to float in the calm waters near the river's banks thus permitting passage of marine traffic on the river. To "close" the bridge, each section was "swung" out into the middle of the river using the powerful outboard motors (3-4 per section) mounted on the pontoons. Once the two sections were combined using chain hoists, they were pinned together. Ramps were then lowered on both ends to the river banks and the bridge was ready to be used for vehicular traffic. The whole process took about an hour to complete. In addition to the swing bridge, there were two Class 100 Heavy Rafts at each crossing site. These rafts were designed by the 8591st LS Co and constructed at the Rheinauhafen in Mannheim. Components of the bridge superstructure were assembled from former German Wehrmacht bridging equipment that had been kept in storage after the war. Wooden barracks (built on stilts to protect them from periodic floods) were constructed at each crossing site to provide billets for a security platoon of labor service personnel stationed at each site. 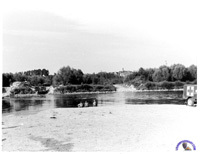 The swim bridges were originally put in place as part of the implementation of plans for the emergency evacuation of US dependents and other noncombatants (NEO - Noncombatant Evacuation Order) to staging areas in France in the event of hostilities. These crossing sites would be used by the US civilians to bypass the major Rhine bridges that could be expected to be clogged in an emergency with military and civilian traffic. Route plans to the individual crossing sites were posted throughout the dependent housing areas in Germany. In later years, as NATO increased its early warning capabilities, NEO planning changed and became less reliant on these alternate crossing points. The mission of the swim bridges changed to supporting the lines of communication between communications zone and combat zone. In 1965, the swing bridges were turned over to the German Army together with the civilian labor personel of the deactivated 6960th and 6961st battalions. The 8591st, 8592nd and 8594th CLGs remained active. The 8595th was deactivated in 1959. I was assigned by the U.S. 7th Army (in 1951-52) to its 7972nd German Labor Service (GLS) Hq., with the 4041; 4042; & 4043 DUKW Companies being attached thereto. I served 6 months in each of the three above mentioned German Companies as one of their American Army Supervisors. The American Commanding Officer of the 7972nd at that time was a Major Frank. I was one of two American military supervisors to arrive in Ettlingen (8541st) in early 1951, the other supervisor was a Captain H.E. Wilcoxson who arrived perhaps two months after me in January 1952. 6 Months later, we were both rotated to one of the other Companies. 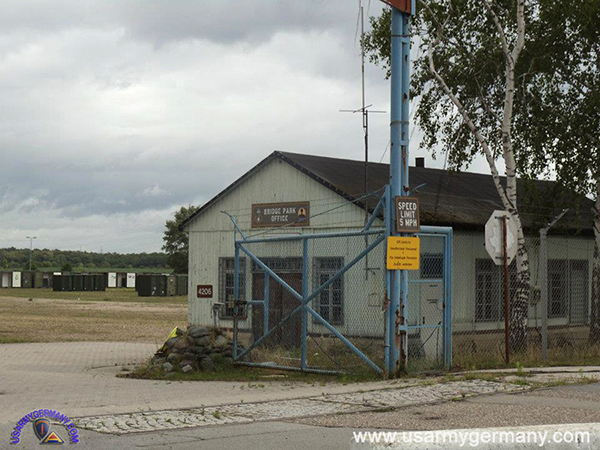 I went to the Russelsheim (8542nd), and the Captain was sent to the 8540th. The 40th shared office space with the 7972nd at the old Krone Hotel, in Bensheim during that period. I returned Stateside to my old position at Lakeside Airport, in Illinois; where I'd been a pilot prior to, and after my tour of duty in the U.S. Army. I have held a pilots license now for the past 57 years; having soloed at the age of 16 in 1947. Question 1: Wasn't Captain Georg Zimmermann the C.O. at the Bensheim Labor Service Company during that period I was there, and wasn't Captain Hermann Koegler the C.O. during that period I was there in 1952? Question 2: As I recall (perhaps I'm mistaken about this in my old age; I'm now 74) these Companies (8540th; 8541st; and 8542nd) were numbered 4041st, 4042nd, 4043rd at that time (1951-52-53)? The Companies were DUKW units! I retured Stateside in August 1953, being last stationed at Schwetzingen. I would appreciate any information concerning these DUKW Companies during that time period (1951-53). Further, if any of the officer's of those several German Labor Service Companies would like to contact me they may feel free to do so. 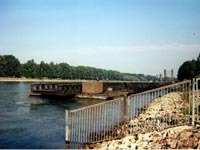 Between 1998 and 1999, six of the bridges and 12 ferries were sold to a company in Holland und disassembled at the river training site at Reffenthal near Speyer. They were loaded, with all machines and equipment including the pontoons, onto ships and transported to Holland. The bridges and ferries were then sold to companies in Paraguay, Brasil and in Afrika. Mr. Oswald was able to obtain this information in the course of an interview in 2004 with Mr Silber, who was a former ferry commander in Bundeswehr and had also served as the last BODAN ferry commander. Mr. Silber had been engaged by the dutch company as a specialist during the disassembly work on the equipment. In 1957, the 8592d CSG operating the USAREUR and 7th Army Bridge Park, was attached to the 521st Engr Gp (Maint & Supply), 7th Army. In 1965, the 8592d transferred to the 11th Engr Gp (Combat), 7th Army. 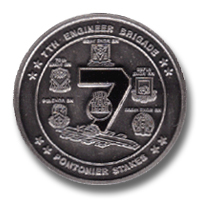 In 1969, the 11th Engr Gp was deactivated and the 8592d CSC became part of the 549th Engr Bn, 130th Engr Bde. On April 1, 1978 the 8592d CSG was transferred from 549th Engr Bn to the 21st SUPCOM and was placed under General Support Center Germersheim. 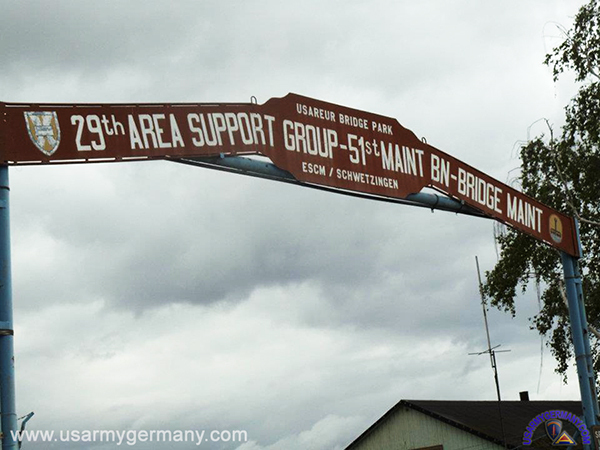 The 8595th LS Bridge Maintenance Platoon was activated in 1954 in Neureut and attached to the 6960 LS Bn. The mission of the 8595th was to provide specialized technical support to the 6 swing Bridges operated by US Engineers at that time. See Picture 10. CO was 1st Lt Karl Ruehl transferred from 6970th CLG followed in 1956 by 1st Lt Karl H Bacher. With activation of 6960th and 6961st the Platoon was deactivated in 1959. - The decision by 7th Army to split up the responsibility for the six bridges among two Labor Service battalions. At that time, one Battalion already existed: the 6960th Labor Service Amphibious Battalion, renamed in 1959 to 6960th Directorate (Swing Brg Maint & Scty) with CO LtCol Schmidt under 11th EngrGp. At the same time the 6961st Directorate (Swing Brg Maint & Scty) was activated under the 555th Engr Gp. Commanding Officer was LtCol Wilhelm A Sigmund (former CO of 8594th LS Float Brg Co). The mission of the 8595th was to provide specialized technical support to the Swing Bridges. Each Bridge Site consisted of one Swing Bridge MLC 100, 2 heavy rafts MLC 100, 2 Powerboats 27ft, and a certain contingent of Amphibious Trucks. The platoon operating the site was housed in wooden barracks on piles complete with mess, orderly room, sanitation, motor pool and so on. The sites were not fenced in, however they were guarded by personnel stationed there. 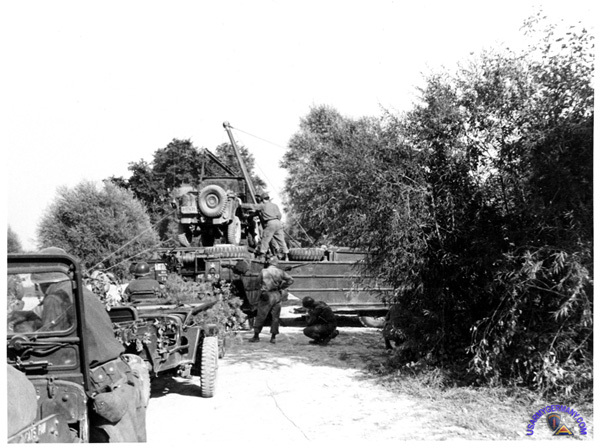 The same setup applies to the Bridge Sites at GERNSHEIM and NIERSTEIN which were operated by platoons of the 8542nd under the 6960th Directorate. 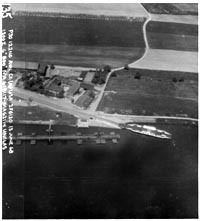 There are however three major differences: While five Swing Bridges had Bailey superstructure, the bridge at GERMERSHEIM had a steelweb superstructure. While 5 of the bridge sites are located on the western (left) shore of the Rhine River, Bridge Site NIERSTEIN was located on the eastern (right) shore. And also at NIERSTEIN, instead of using the pivot piles, a telescope arm was used for technical reasons. 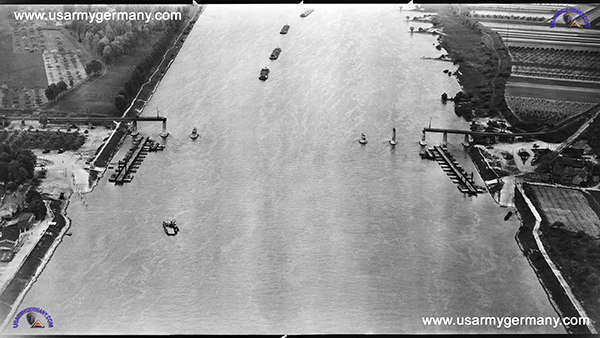 Regularly, once a month, on a Sunday morning the river was closed to ship traffic by German Authorities (Wasserschiffahrts Direktion) and the bridges were closed - mostly operated by US Engineers and together with German personal. The procedure for river closing was: a unit asks higher headquarters that the river be closed between Rhine-Km 310.4 and 312.0 on a certain date and time. This request is forwarded thru the chain of command to the American Embassy in Bonn. They in turn ask the German Ministry of Traffic who than will give orders to the "Wasserschiffahrtsdirektion" in Mainz. Information pertaining to the closing is then given to radio stations, waterpolice and some civilian organisations who work with Rhine River shipping, one week prior to the event. Approximately 500 m upstream and downstream of the bridge site on the left and right banks traffic signs with red lights are installed informing ships to stop. In addition, water police are positioned with their boats upstream and downstream. Only after receiving their OK, can the bridge commander start with the bridge closure. This routine was strictly kept until 1965. Any bridge "deadlined" (inoperable) for more than 12 hours caused reports, hectic questions from higher headquarters, in short such events were unthinkable. Deadlining could be caused by fuel lines (of engines) being clogged, outboard engines of the "Mules" that would not start because of low batteries, wires that were broken and so on. Despite being build very ruggedly, incidents that occurred once or twice a year could cause serious damage to the half bridges moored along the banks of the river when captains of civilian ships ran into them due to fog, drunkeness or misorientation. In 1965 the 6960th and 6961st - without 8591, 8594 and 8592 - were deactivated and the bridges and rafts were turned over to the German Army including personnel to form one Engineer Bataillon, which was deactivated 1993. Though it was said that the worst crime within the army was to hand out pencil and paper to engineers, we are still proud of having done a good job, not only by supporting the US Army but also in helping defend the peace in Europe during the Cold War. If you have more information on the history or organization of the 6961st CLG, please contact me . as it exits the river during a bridging exercise. the DUKW's power winch in preparation to loading the vehicle into the DUKW's cargo space. Operations continue as other jeeps line up for loading onto 8542nd DUKWs. 1. DUKW enters river . 3. Several DUKWs during a river crossing exercise. 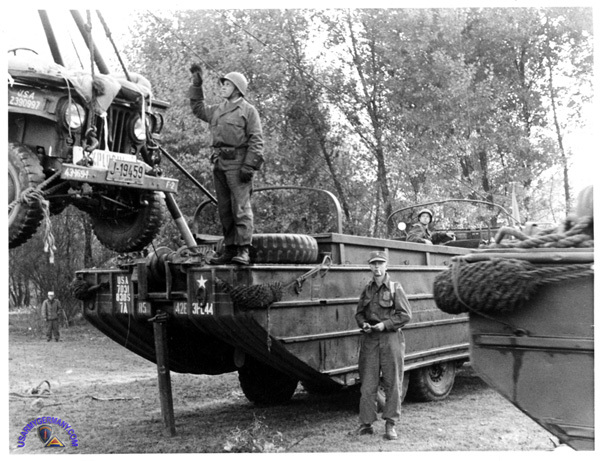 1st Lt Heinrich Scheffler, Motor Officer of the 8542nd LS Amphibious Truck Co reports that a LARC-V was delivered to the unit in Ruesselsheim vor evaluation tests on the Rhine River. The US Army trainer who was responsible for training the drivers of the LARC during the trials SFC Toepfer. The LARC-V performed well during the tests and was returned to the US Army after one year. In the photo on the left, the Chief Engineer, 7th Army (leaning into the cabin) and several members of the Labor Service organization take a closer look at the LARC-V.
BTW, 53 LARC-V's were delivered to the Bundeswehr "Amphibisches Transportbattailon 2" und "4" in Emden in the 1963/64 timeframe. 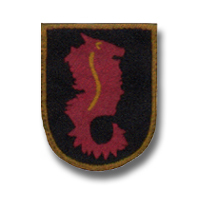 1950 The 8502nd LS Co (Engr Const) was activated in Eschborn near Frankfurt and assigned to the 6970th LS Center. 1951 On March 3, the 2nd and 3rd Platoons were relocated to Griesheim near Darmstadt and the rest of the company to Garmisch-Partenkirchen. 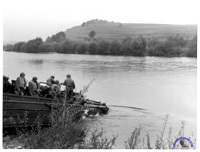 In Griesheim and at the Bridge Training Area "Lampertheim" near Mannheim, 1st Lt Russel from the Engineer School trained the detachment in assembling the M4 Bridge and driving Powerboats. On April 20, the platoons were relocated to Kimbro-Kaserne at Murnau and placed under the command of 7710th EUCOM Engineer School. 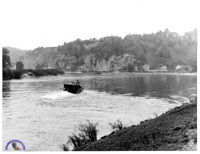 At Staffelsee, a lake near Murnau, US-Engineers were trained by Labor Service personnel in bridge construction and Powerboat driving. 1952 On May 1, the Detachment 8502nd LS Engr Co was reorganized and constituted as the 8594th Labor Service Treadway Bridge Company with 5 officers and 133 men. CO was Capt Wilhelm A Sigmund. The M4 bridge was exchanged against the Class 60 Float Bridge, and on Sep 3, the company was redesignated as the 8594th LS Engr Float Bridge Co.
1954 The Engr School discontinued bridge training and the company was relocated to Ettlingen near Karlsruhe - initially for few month at Rheinland-Kaserne, and then to Neureut-Kaserne, Neureut. The company is assigned to the 555th Engineer Group with CO Col Linksweiler at Phillips-Bks in Karlsruhe. First bridge training at Bridge Training Area "Berghaeuser Altrhein" near Speyer with the 1402nd Engr Bn. 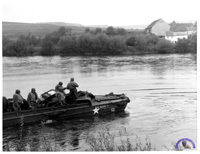 The 499th Engr Bn with its swing bridges on Rhine river was supported with powerboats during highwater. 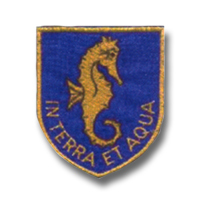 1955-1959 The company participated in many excercises from company to battalion level within 7th Engr Bde throughout Germany on the Rhine River, the Main River and the Danube. 1959 In August, the Company was assigned as subordinate unit to the newly activated 6961st CLG (Swing Bridge Maint & Scy). The CO of the new Bn was B-10 (Lt Col) Wilhelm A Sigmund former CO of the 8594th. The XO of the company, B-9 (Maj) Ferdinand Skalitzky, became CO.
1960 The company developed and constructed an adapter, the so-called "Marriage Load," for M4T6 and Class 60 bridges, which became part of the engineer equipment of the US Army. 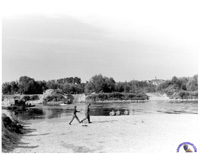 1960-1964 Many exercises on the Rhine, Main, and Danube rivers. 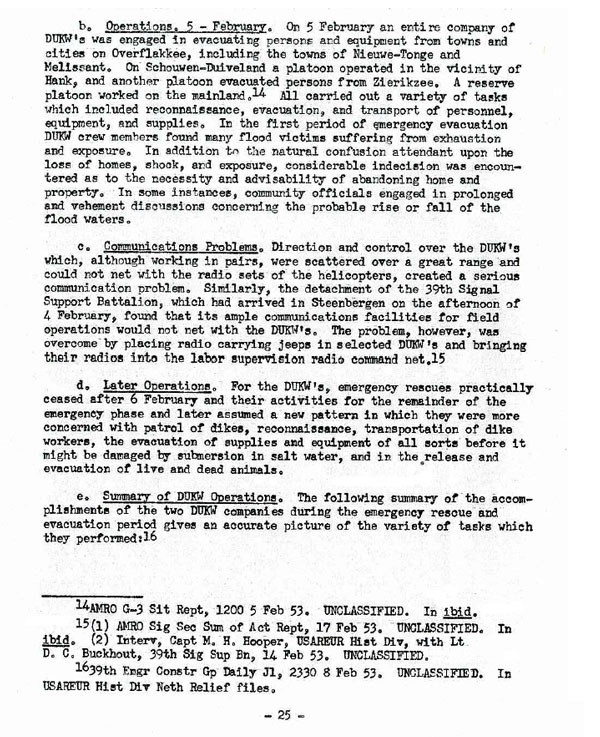 Participation in FTX "Wintershield" in 1962 and "Big Lift" in 1963. 1964 In August, the 6961st CLG was deactivated and the 8594th CLG again became a separate unit under the 555th Engr Gp. The 3rd Engr Bn from Munich constructed a bridge on the Danube river at a temperature of -20 F (!). 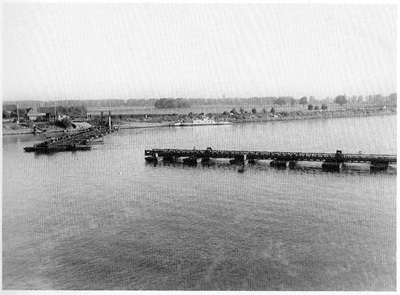 At Rheinhausen, on the Rhine River, the 78th Engr Bn constructed a Class 60 Bridge in 1 hour and 47 minutes. 1965-1969 Many exercises. 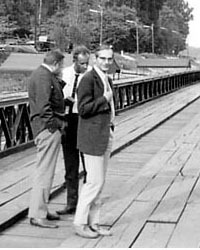 In 1966, a Class 60 Bridge was built across the Rhine River at Bridge Training Area "Leeheim" together with the 8591st LS Flooat Bridge Co (Lithuanian). 90 bays to span 1350 feet. 1969 On June 25, the 555th Engr Gp with CO Col Worthington was deactivated and the 8594th CLG became subordinate to the newly reactivated 565th Engr Bn with CO Lt Col Bartow. 1969-1978 Many exercises. In 1970 participation in "Reforger III" near Kranzberg crossing the Amper River with Class 60 and Trestle Bridges. In Jan 1973 "Reforger IV". On May 13 1973, an FTX with 7th Engr Brig, CO Lt Col Hodgsen, at Grossmehring. The 502nd Engr Co and 8594th CLG constructed a Trestle Bridge across the Danube River. This should be the longest Bridge of this kind ever built. Initiated by Capt Greene, S-3, 565th. Also in 1973, "Reforger V" at Altmuehl. In 1974, the company was involved with fencing in the Ammo Depot Ansbach. Winter training in Oberammergau and Chiemsee. In 1975, "Reforger V" in the Wuerzburg Area. November 1975, Neckar River crossing at Gundelsheim with the 9th Engr Bn. In 1976, Bridge Training with the 9th Engr Bn near Speyer and with the 79th Engr Bn at Berghäuser Altrhein (Reffenthal). Participation in FTX 7thEngr Brig on the Main River near Schweinfurt. In 1977, "Reforger 77"; 1978, FTX 565th Engr Bn and FTX 237th Engr Bn; "Reforger 78". In Oct 1978, the company was issued the Ribbon Bridge and renamed 8594thCLG Engr Ribbon Bridge Co.
1978 Numerous exercises. Transports of ammunition for 3rd Infantry Division; "Reforger 79" on the Main River; Ribbon Bridge training with 502nd Engr Co at Leeheim. Crossed the 3/48 FA Bn with Ribbon Bridge across Neckar River. 1983 CO of 8594th CLG,B-9 (Maj) Ferdinand Skalitzky, retired. He was awarded the "Superior Civilian Service Award" by Col Joseph E Oder, Commanding Engr. New CO is B-9 (Maj) Hans Tollkuehn. 1983-1991 As in the years before, numerous maneuvres, FTX's, support of Reforger activities, projects in helping civilian communities, were completed. 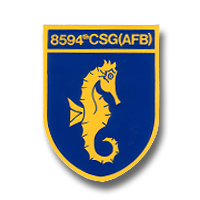 1991 On Sep 30, the 8594th CSG (AFB) was deactivated. The unit had served the US Army for 40 years. Pass in review on 25 July 1991 (see picture #9; Front, right, is B-9 (Maj) Tollkuehn). In 1987, winner of the Commanding General`s VII Corps Supply Excellence Award. In 1989, runner-up for the Commanding General`s VII Corps Supply Excellence Award. In 1990, winner of the Commanding General`s VII Corps Supply Excellence Award. Also, the unit was awarded the 7th Engineer Brigade Certificate of Achievement for Meritorious Service to the VII Corps and the Wartime Host Nation Support Program. Numerous letters of commendation from VII Corps, 3rd Infantry Division, 7th Engineer Brigade, and other commands.